When diagnosed with prostate cancer in 2000, Thomas A. Farrington describes himself as being completely uninformed about every aspect of the disease, especially his extremely high risk level. 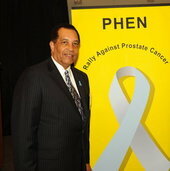 During his treatment period, Mr. Farrington continued to study prostate cancer and decided that his unsettling experience facing the disease, along with the experiences of other men in treatment with him could help others that would follow them along their journey of hope to beat prostate cancer. In 2001 he released "Battling The Killer Within." The book provided an insightful look at men facing prostate cancer and the prostate care system in the United States. It highlighted the harsh impact of this system on Black men contributing to the disparity they experience. Professionally, Mr. Farrington is an entrepreneur and business executive with more than 30 years experience in the Information Technology industry. In 1969, he founded Input Output Computer Services, Inc. where he served as president and chairman. This company was a pioneer in the evolution of IT professional services. Throughout his business career, Mr. Farrington has been involved extensively in industry, civic, and community activities. He was selected one of "Ten Outstanding Young Leaders of Greater Boston", appointed to the Export/Import Bank Advisory Board by President George H. Bush, and appointed by President Clinton to the Historically Black College Advisory Board. Massachusetts Governor Jane Swift appointed Mr. Farrington to the board of the Massachusetts Technology Park Corporation, and he serves as a board member of the Greater Boston Chamber of Commerce. Mr. Farrington is a member of St. John's Baptist Church in Woburn, MA, the Sigma Pi Phi fraternity and a NAACP life member. He received his B.S. degree from North Carolina A&T State University in electrical engineering and attended the Northeastern University Graduate School of Engineering. Thomas A. Farrington is a noted speaker on the issue of "Men's Health," where he motivates men with straight talk to take charge of their health.